We embarked upon this community gardening project about three months ago…well we fell into it actually, it wasn’t a planned-for-a-long-time thing. It was more a crime of opportunity. We saw the ad for community garden plots one day and the next day we signed up. Then we waited and waited and waited for it to be dry enough to turn over the soil so we could plant. When that finally happened we went to town and put seeds in the ground. While it’s only mid-July, we are beginning to reflect on what’s grown, or not, and what we might do next year. Why didn’t the lettuce come up? Just what is eating the zucchini? Did we really plant spinach-there’s no spinach? Why did the Detroit Red beets come up but not the Golden Beets? Next year we will do some things differently. It’s dry this year but next year with a little moisture we could get a good crop. The grasshoppers are bad this year but next year we’ll spray earlier and that should hold them at bay. The barley (or wheat or oats) didn’t do that well this year but it has been an unusual year and next year should bring us back to a good growing season. Potato bugs: We declared war on the potato bugs. I went from the YEWWWWW of knocking them on the ground and then grinding them between two hard surfaces to squishing them left and right between my gloved thumbs and forefingers. I became a two-handed squisher. My gardening partner squished, she removed their eggs, she left no leaf unturned. One day last week I squished 95 bugs in one visit! Now suddenly (if you can say suddenly after you’ve killed hundreds and hundreds of them) their numbers are way down. Is it too soon to declare victory? Earth worms: Earth worms are good for your garden. When we were planting we found one earthworm. And it seems he must have just been passing through. We just didn’t see he had his suitcase with him as he made his way to some other garden plot. And that’s all we’ve seen. This is not good. NEXT YEAR we will advertise in the 2012 earthworm travel guide: Come and stay at our garden plot. Under new management as of 2011. Stay rent free! The dirt is freshly ‘amended’ (the fancy gardening word should attract a good worm base), there will be regular water and robins are banned from the premises. We are enjoying our time in the fresh air-bent over pulling at the robust crop of weeds. Why won’t spinach even dare to root in our soil while the grass and untold unwanted plants have roots that go half way to China. Our garden doesn’ t look as good as many (this year) but we are marvelling at what wondrous things are happening. Flowers on the potatoes, fennel showing up, cauliflower heads taking shape, cabbage….not tood good .well let’s just say NEXT YEAR we will start many plants indoors. We thought we would go to the garden once a week but we find ourselves drawn there most mornings. Once we rein in the weeds, maybe we won’t go there so often…but then how will be able to watch the progress? And today….today we noticed two babies. We cooed at them as you would an infant. 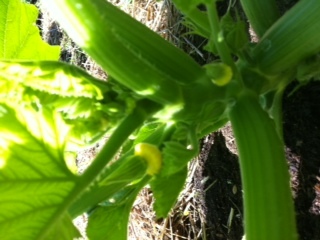 There they were in the bright sunshine two little sunburst squash! Gosh, we may have something THIS YEAR! Previous postA July afternoon.. from the other side of the desk…. Your garden sounds like more fun that vegetables. I do hope you have more little squashes (are they called squishes?). We are swamped with cucumbers. The beans are coming in full speed. The two weeks of wet weather seemed to damage half our tomato plants and the tops are dying off from some kind of wet weather virus. Tanya has two big basins of apricots soaking in sugar to make jam . Our house is full of jam cooked and uncooked. Yes indeed the Dan Quayle spelling haunts those of us who have enough “experience” to know who Dan Quayle is/was. I actually had to look up the spelling of the tuber to see if I was going down a Quayle road or not. Really the toe on your foot has an “e” on the end so it makes some sense that the “toe” in potato might too have an “e” on the end. Our little garden is but a hobby with hopes of production. Farmers who can’t plant or have Mother Nature take a vicious swipe through dealing them one or more of so many things that can hamper agriculture are dealing with their livelihood.